Like the bead cabinet, this is a material which children start to use in the primary communities (preschool), and which continues to be used in the elementary rooms. The basic idea is simple enough. You know those magnetic alphabets everyone has? The ones where, well after their kids are in college, letters still show up in unlikely places? It’s like that. Your kids practice spelling out words and learning their alphabet and sounds with these. In elementary rooms, these are used for spelling lessons as well as writing lessons. As with all Montessori materials, though, there is more to it than initially meets the eye. When this material is introduced to pre-readers (usually in preschool), the children use it to phonetically spell things out. The teacher does not correct spelling, and does not make the child read what he has written. The idea here, developed by Maria Montessori in her preschool communities, is that very young children have the capacity to analyze the sounds in words before they are able to synthesize and read them. This prepares them for reading later. As the children get older, they use this same material to work on correct spelling and learning phonograms - a lesson might, for example, have the child spell all words that include the *igh* phonogram, and therefore learn concretely that *igh* always makes a long i sound. Also - and I know this is repetitive if you’ve read other blog posts I’ve done on Montessori materials - the kinetic element in this work is so valuable. 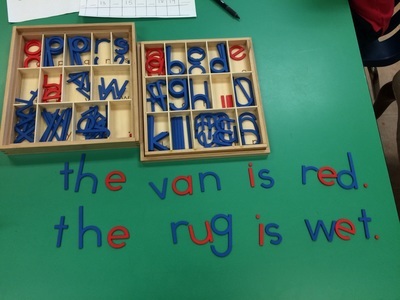 Children are learning these lessons not just through hearing it and writing it, but through touching it - they literally build the words themselves. This is such a powerful means of learning. Further, Maria Montessori being the genius she was, there is an added visual element to this material. You may have been wondering about the different colors - consonants are pink or red, and vowels are blue. Children can see the types of sound they are representing. With this work, vowels not only sound different from consonants, they look different. Here is a super-cool video of a teacher giving presenting the first lesson with the moveable alphabet. This is meant for preschool rooms, but we would present it like this to all of our pre-readers. Now, are you ready for the part where we see what else this can do? Kids can, throughout their use of this, also work on building phrases, sentences, and stories. How cool is it that the dots for the i's and j's also work as periods? And for extra awesomeness, the same principle is applied to learning other languages (the phonograms used, spelling, vocabulary), other alphabets, and even musical notation. Simply put, the moveable alphabet breaks a language down into its simplest parts so that children can manipulate it and understand it. This will allow children to become more confident readers, writers, and speakers - all things that will be the foundation for their success in other areas of their education.